Creating great content isn’t always easy. Like most disciplines, it requires a substantial amount of research to get the most effective output. Due to the multi-dimensional nature of content marketing, it can become confusing as to who to target, and where to start. To ensure your digital content is worthwhile from a commercial perspective, then considerations into how to make it valuable to both your audience and your business is crucial. Making it relevant and interesting to your intended audience ensures you get a high level of engagement towards your content piece. Ensuring it is aligned with your business plan provides purpose and benefit to your long term direction as a company. Creating great content is all about the balance of these two areas, as imbalance either way could lead to your content being off point and unsuccessful in its objectives. 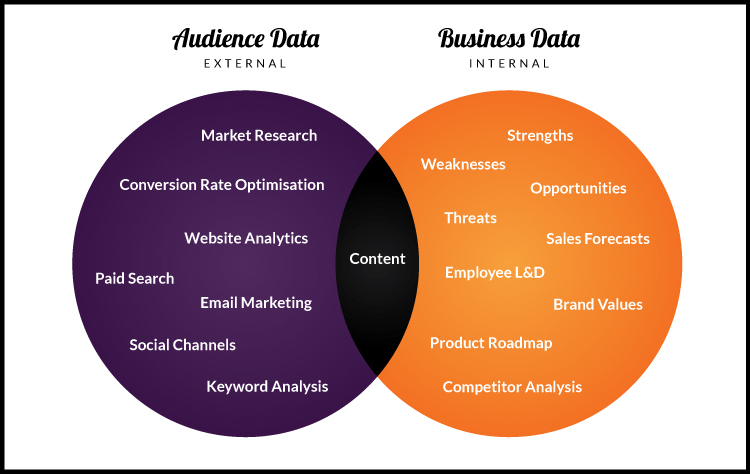 Below is a simple Venn diagram, that will help you understand what sources of research you need to consider before embarking in your company’s content strategy moving forward. Feedback Polls from services such as Hotjar are a good way to get valuable data from your website that you can use towards content ideas moving forward. Data sources such as Data Market, World Bank and this list of Awesome Public Datasets should give you plenty to explore to begin with. If you are currently carrying out CRO on your website, then the data from your experiments may provide valuable insights on your audience behaviour towards functionality and content matter on your site. Understanding how your audience use your site could give you ideas on how best to carry out your content pieces, and what subject matters to focus on. This data could prove handy for trying to understand your demographic, and to see what gaps you can exploit in your current content. Although Paid Search typically targets audiences at the end of the purchase funnel, data on split testing display ads and audience building might provide beneficial in understand audience behaviour and habits. Data gathered from email marketing applications such as MailChimp can give you understanding into the sort of content your audience find interesting, and what content forces users to subscribe. Alongside this, Facebook Insights is a hugely powerful tool that allows you to drill into to specific demographic data of users. Coupled with email addresses gathered within your CRM, you can really start to understand and segment your audience in a much more granular way. Finally, using search engines such as Google can give you some understanding into what your audience are searching for online. Although it can be unwise to ‘chase’ neglected keywords, analysing their trends can give you some insight into what is cared about by your audience, and whether or not your content is something that would be considered valuable by the majority. Spawned from the SWOT Matrix, knowing these four factors in your business plan can help you understand improvements and opportunities where your content can help benefit your business. L&D is an important factor for any company, and can be an opportunity to kill two birds with one stone when it comes to potential content subject matters. Encouraging your staff to create content as part of their learning and development can be a great way to produce innovative and forward thinking topics that benefit your business both internally and externally. Looking at sales forecasts and targets can help focus you on the areas you want to aim for and improve within your long term financial plan. Whether it be a service you want to improve, or a new product that you are launching – steering your content towards relevant areas of improvement gives it a stronger sense of purpose and value as a whole. We’ve also built a free tool to help you do your marketing forecasts, which you can access here. Brand values have a tendency to evolve over time, and ensuring your content reflects these values gives your brand an effective way of sending out the necessary messages moving forward. You can read more information on the importance of a strong brand in digital marketing here. Taking a step from marketing strategies to instead look at the bigger picture of the product/service itself can be a really good way of reminding yourself of the physical goal you are trying to achieve. Taking your product roadmap into account may inspire you to launch content at certain points of the roadmap, as your product progresses. Although forward thinking marketing should always be the goal, it is wise to keep an eye on your competitors and what they are up to on the digital landscape. This could give you knowledge into what they are not doing (as opposed to what they are doing) and therefore providing some valuable content gaps that you can exploit. Spending the time to research about the parties affected by your content will inevitably give you information to be inspired by, and ultimately give you a content strategy that is more refined and relevant as a result. The skill then comes in ensuring your content takes the audience and business insights you have gathered, and then presenting it in a wholly balanced way. If you’re just starting to gather your research, use our free forecaster below to help you get accurate forecasts on your marketing moving forward.